The Silk Road has often been blamed for the spread of infectious diseases in the past between East Asia, the Middle East and Europe. While such a hypothesis seems plausible, there is actually very little concrete evidence to prove that diseases were transmitted by early travellers moving along its various branches. 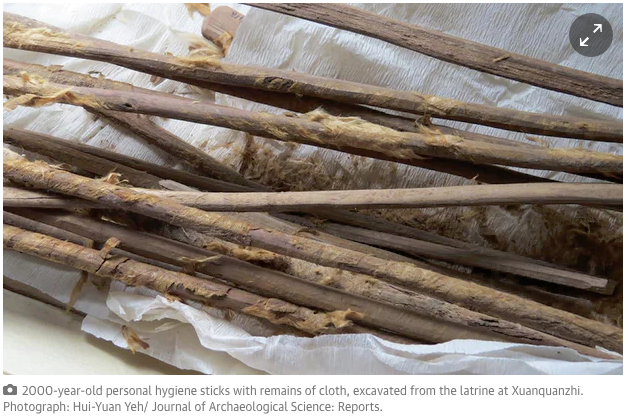 The aim of this study is to look for ancient parasite eggs on personal hygiene sticks in a latrine at a large relay station on the Silk Road at Xuanquanzhi (111 BCE—CE 109), at the eastern margin of the Tarim Basin in north-western China. We isolated eggs of four species of parasitic intestinal worms: Chinese liver fluke (Clonorchis sinensis), Taenia sp. tapeworm (likely Taenia asiatica, Taenia solium or Taenia saginata), roundworm (Ascaris lumbricoides) and whipworm (Trichuris trichiura). The Chinese liver fluke requires wet marshy areas to sustain its life cycle and could not have been endemic to this arid region. 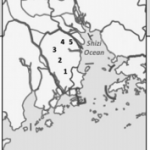 The presence of this species suggests that people from well-watered areas of eastern or southern China travelled with their parasites to this relay station along the Silk Road, either for trade or on government business. 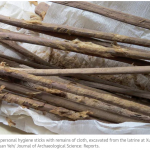 This appears to be the earliest archaeological evidence for travel with infectious diseases along the Silk Road. (…) Sediments provide the opportunity to reconstruct the pollution history and evaluate impacts so this study investigates the abundance and distribution of toxic metals, FIB, and ARGs released from hospital effluent wastewaters and their presence in river sediments receiving systems. 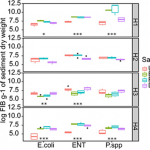 ARGs (blaTEM, blaCTX-M, blaSHV, and aadA), total bacterial load, and selected bacterial species FIB [Escherichia coli, Enterococcus (ENT)] and species (Psd) were quantified by targeting species specific genes using quantitative PCR (qPCR) in total DNA extracted from the sediments recovered from 4 hospital outlet pipes (HOP) and their river receiving systems in the City of Kinshasa in the Democratic Republic of the Congo. (…) These findings demonstrate that several sources including hospital and urban wastewaters contribute to the spread of toxic metals and biological emerging contaminants in aquatic ecosystems. (…) The Lagos Lagoon (Nigeria) is one of Africa’s largest estuarine ecosystems, and is impacted by hydrocarbon pollutants and other industrial and municipal wastes. The goal of this study was to elucidate microbial community structure in Lagos Lagoon sediments to identify groups that may be adversely affected by contamination, and those that may serve as degraders of environmental contaminants, especially polynuclear aromatic hydrocarbons (PAH). 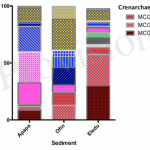 Sediment samples were collected from sites that ranged in types and levels of anthropogenic impacts. (…) The largest group of OTU correlated with PAH levels were PAH/hydrocarbon-degrading genera of the Oceanospirillales order (Gammaproteobacteria), which were most abundant in the hydrocarbon-contaminated Apapa sediment. Similar Oceanospirillales taxa are responsive to marine oil spills and thus may present a unifying theme in marine microbiology as bacteria adapted for degradation of high hydrocarbon loads, and may represent a potential means for intrinsic remediation in the case of the Lagos Lagoon sediments. Modern agricultural practices create environmental conditions conducive to the emergence of novel pathogens. Current surveillance efforts to assess the burden of emerging pathogens in animal production facilities in China are sparse. 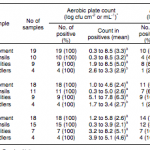 In Guangdong Province pig farms, we compared bioaerosol surveillance for influenza A virus to surveillance in oral pig secretions and environmental swab specimens. (…) Climatic factors and routine animal husbandry practices may increase the risk of human exposure to aerosolized influenza A viruses in swine farms. Data suggest that bioaerosol sampling in pig barns may be a noninvasive and efficient means to conduct surveillance for novel influenza viruses. In order to investigate Enterobacteriaceae, coliforms, Escherichia coli, and Salmonella contamination a survey was conducted at three peanut confectionery processing companies (A, B, and C) in Brazil. 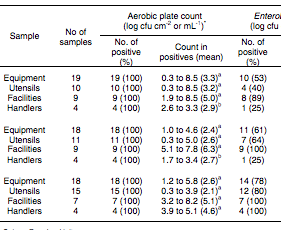 Samples of different peanut confectionery products (n=59), peanut raw material (n=30), manufacturing environment (n=116), and workers’ hand surfaces (n=12) were analyzed. (…) The results showed that the manufacturing environment, including food handlers were considered the main sources for possible contamination of peanut confectionery products. 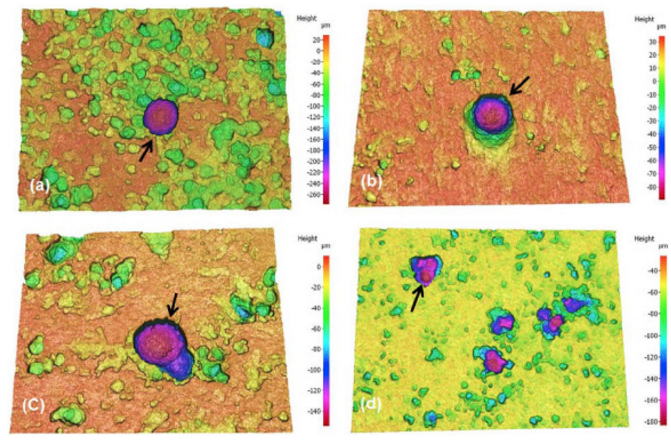 3D optical surface images of steel exposed to test sites for 3 months. The influence of atmospheric conditions on the corrosion of steel and its associated microbial community was studied. 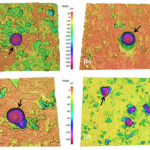 Surface analysis revealed greater localized corrosion in steel exposed to near-ocean atmospheres with high chloride deposition compared to inland and subalpine sites. 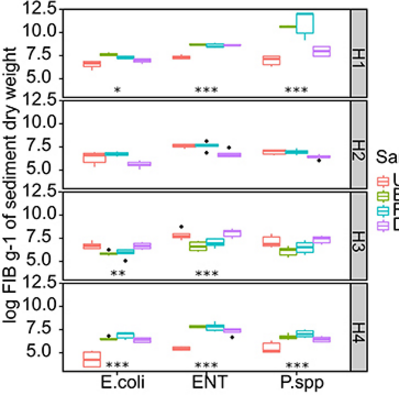 High-throughput sequencing analysis of corrosion products showed that dissimilar microbial communities and dominant species were deposited on steel in the different atmospheres. (…) These results suggest that acid production and EPS synthesis can be important mechanisms for microbial corrosion of steel under atmospheric conditions. Great to hear you enjoy them!